Are Porcelain Veneers In Colliersville Right For Me? You cannot wish away your smile defects. While your smile is healthy, those dark stains and chipped front teeth hurt your self-confidence. A friend has told you about porcelain veneers from Collier dentist, Dr. Joshua A. Holcomb. Could they be the cosmetic refurbishment you need for a dazzling new look? Find out about veneers and if you qualify for them at a cosmetic dentistry consultation with Dr. Holcomb. Just What are Porcelain Veneers? Who Can Receive Porcelain Veneers? To receive porcelain veneers, your teeth and gums must be healthy–free from decay, extensive restorations and gum disease. Additionally, as a veneer patient, you must understand that these laminates are a permanent refurbishment because in order to place them, your dentist must remove a thin portion of tooth enamel–about ½ to 1 mm. This enamel reduction allows proper space within your mouth for the veneers to fit comfortably and function properly. Dr. Holcomb places temporary veneers until the permanent ones are crafted. The treatment involves evaluation by oral examination and digital X-rays. Also, the dentist may take photographs and oral impressions to send to the dental lab where a skilled technician will construct a three-dimensional model of your teeth. From there, the technician crafts each veneer individually, ensuring size, shape and color are right for your smile and facial features. On your return visit, Dr. Holcomb will remove the temporary veneers and bond the permanent ones in place with a special adhesive. He may adjust the color of the adhesive as needed and do a final shaping and bite adjustment. What Is It Like To Have Veneers? Of course, you’ll be pleased with how even, straight and defect-free your smile looks. Regarding caring for your porcelain veneers, just brush twice a day with a soft brush and floss daily as you normally would. See Dr. Holcomb for your semi-annual check-up and cleaning. Additionally, treat your veneers–and all your teeth–gently. Don’t chew hard foods such as ice or peanut brittle. Wear a mouthguard if you play sports or are a habitual teeth grinder. And, avoid smoking and staining foods and beverages because while veneers are very stain resistant, they may discolor a bit over time if not well cared for. Overall, your veneers should remain bright and beautiful for ten years or even more! 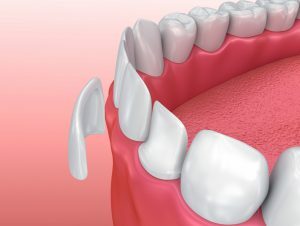 For more information on porcelain veneers and to see if they are right for you, please set up a cosmetic dentistry consultation with Dr. Holcomb. Your smile could change for the better in just two dental visits! Comments Off on Are Porcelain Veneers In Colliersville Right For Me?